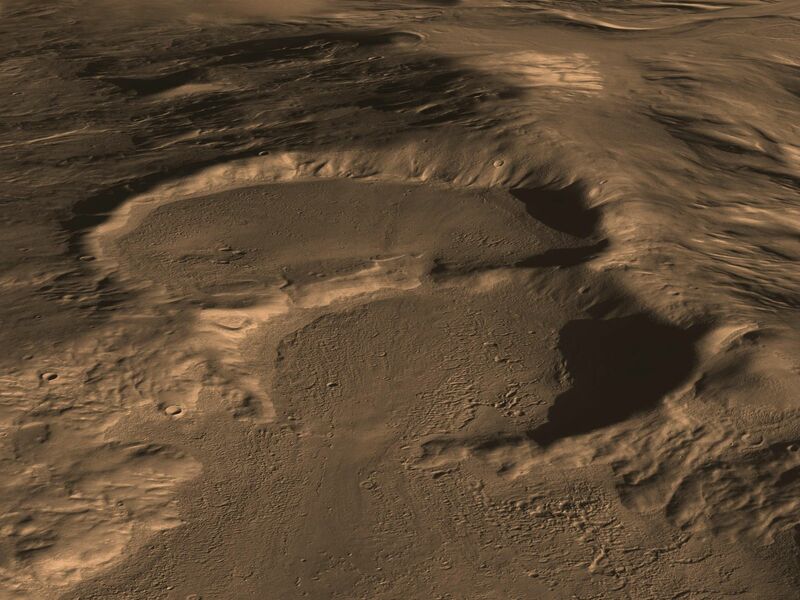 This computer graphic image shows three craters in the eastern Hellas region of Mars containing concealed glaciers detected by radar. 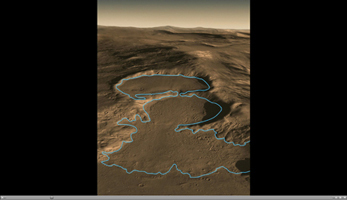 The image shows how the surface looks today with the ice covered with a layer of Martian soil. The image was created using image data from the Context Camera on the Mars Reconnaissance Orbiter (MRO) spacecraft combined with results from the SHARAD radar sounder on MRO and HRSC digital elevation map from the Mars Express spacecraft. 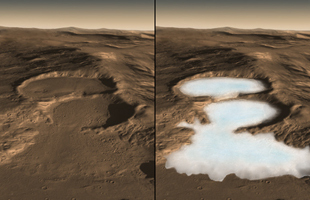 The color of the Martian surface and ice was estimated from MRO HiRISE color images of other Martian craters and the polar ice caps. 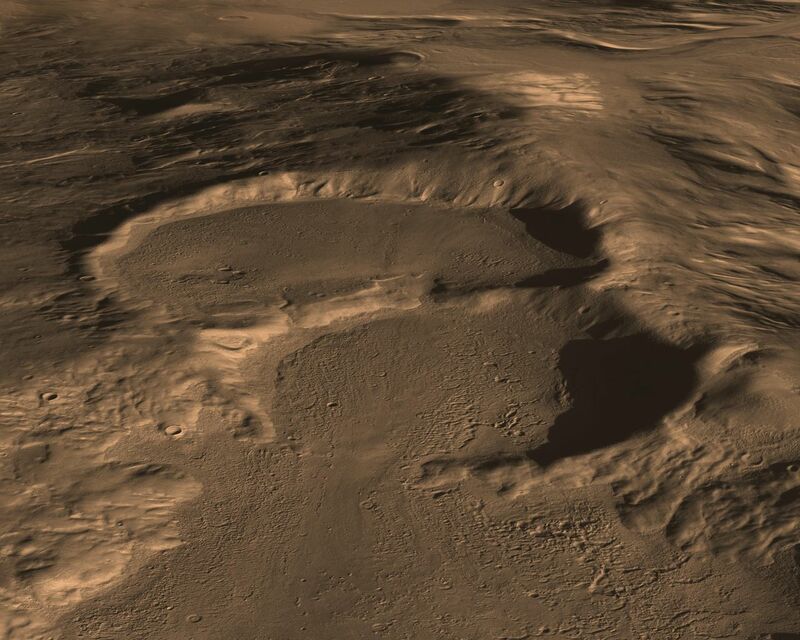 The buried ice in these craters as measured by SHARAD is ~ 250 meter thick on the upper crater and ~ 300 and 450 meters on the middle and lower levels respectively. Each image is 20 km (12.8 mi.) across and extends to 50 km (32 mi) in the distance. 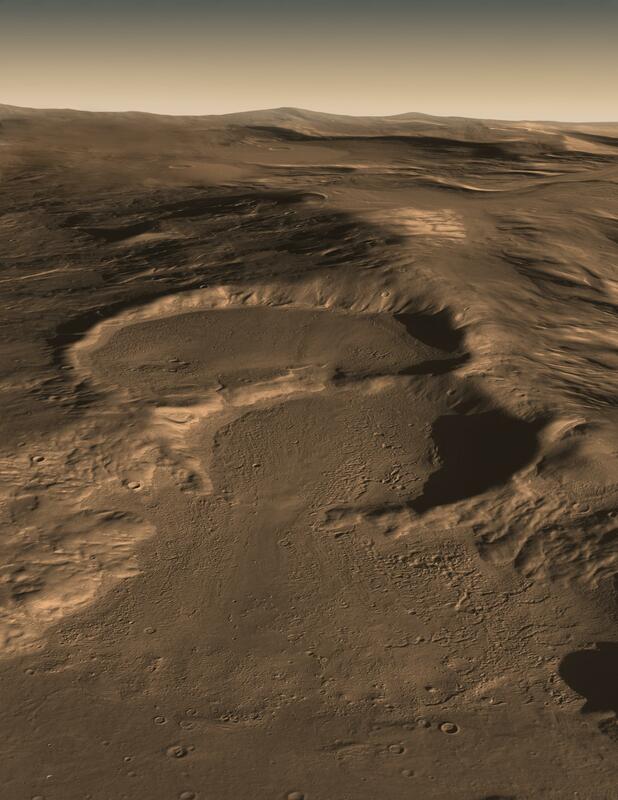 Recent measurements from the Mars Reconnaissance Orbiter SHARAD radar sounder have detected large amounts of water ice in such deposits over widespread areas, arguing for the flow of glacial-like structures on Mars in the relatively recent geologic past. This suggests that snow and ice accumulated on higher topography, flowed downhill and is now protected from sublimation by a layer of rock debris and dust. Furrows and ridges on the surface were caused by deforming ice. The movie begins with a view of how the surface looks today. A blue line is drawn on the image and an artist's concept then reveals what the ice may look like underneath. The movie was created using image data from the Context Camera on the Mars Reconnaissance Orbiter (MRO) spacecraft combined with results from the SHARAD radar sounder on MRO and HRSC digital elevation map from the Mars Express spacecraft. 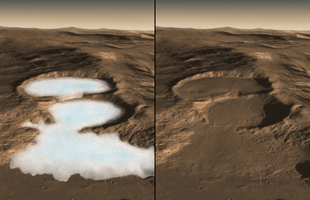 The color of the Martian surface and ice was estimated from MRO HiRISE color images of other Martian craters and the polar ice caps. 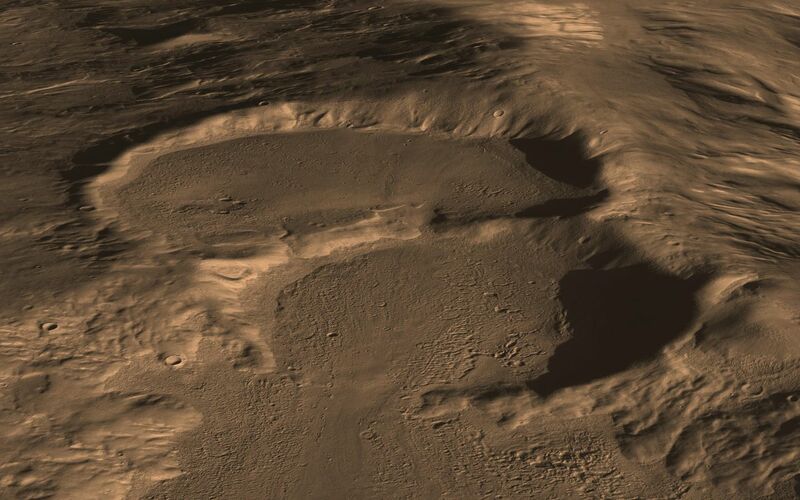 The buried ice in these craters as measured by SHARAD is ~ 250 meter thick on the upper crater and ~ 300 and 450 meters on the middle and lower levels respectively. Each image is 20 km (12.8 mi.) across and extends to 50 km (32 mi) in the distance.